#1. This week's number one is an international point guard Kevin Pangos (185-93, college: Gonzaga, currently plays in Euroleague). He led his Spanish team FC Barcelona to a victory over the 14th-ranked Gran Canaria (8-20) crushing them 93-64 in the Euroleague in Tuesday night's game. Pangos was MVP of the game. He scored 19 points, had 4 rebounds and dished 4 assists in 21 minutes on the court. FC Barcelona Lassa (16-12) is placed fifth in the Euroleague. There are only two games left until the end of the Euroleague Regular Season. So now every game will be critical. This year Pangos averages: 7.1ppg, 1.2rpg, 3.3apg, 2FGP: 44.6%, 3FGP: 28.4% and FT: 78.2% in 28 games he played so far. He has a dual citizenship: Canadian and Slovenian. 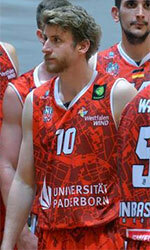 Pangos is currently a member of the Canadian senior national team. #2. Second place goes to an experienced former international shooting guard Andrew Rautins (193-86, college: Syracuse, currently plays in Turkey). Rautins was the main contributor in Acibadem's victory against the 12th-ranked Buyukcekmece (6-15) 106-103 in the Turkish BSL on Sunday night. He was the best player in that game. Rautins recorded 30 points (!!!) in 45 minutes. Bahcesehir Koleji Istanbul (11-10) is placed seventh in the BSL. It's Rautins' first season with the team. He has relatively good stats this year: 15.0ppg, 2.6rpg, 2.9apg, 2FGP: 56.7%(17-30), 3FGP: 46.7%(84-180) and FT: 93.8%(30-32) in 21 games. Rautins is a naturalized American. He played for the Canadian national team in 2013. #3. The Canadian player who performed third best last week abroad was an international guard Philip Scrubb (191-92, college: Carleton, currently plays in VTB United League). Scrubb contributed to a 2-point Zenit's victory against the 11th-ranked Enisey (6-14) 87-85 in the VTB United League in Sunday night's game. He was the top player that evening. Scrubb scored 24 points and added 5 assists. Zenit Sankt Petersburg (13-7) is placed fifth in the VTB United League. It was his team's third consecutive victory in a row. This season Scrubb has relatively solid stats: 11.3ppg, 2.1rpg, 4.2apg, 2FGP: 43.5%, 3FGP: 42.3% and FT: 86.7%. He is another player who holds two passports: Canadian and British. Scrubb is also a member of the Canadian senior national team. #4. Center Robert Sacre (213-89, college: Gonzaga, currently plays in Japan) contributed to a 2-point Hitachi Sunrockers' victory against the second-ranked Kyoto Hannaryz (27-22) 105-103 in the Japanese B League last Sunday. He was the top player that evening. Sacre had a double-double by scoring 46 points and getting 14 rebounds in 45 minutes. Hitachi SunRockers Tokyo-Shibuya (23-26) is placed fourth in East group. Sacre has individually a very good year with high stats. He averages: 19.6ppg, 9.1rpg and 1.4apg in 49 games. Sacre used to play for the Canadian national team back in 2015. #5. International point guard Kaza Kajami-Keane (185-94, agency: Interperformances, college: Carleton, currently plays in Holland) could not help Zwolle (23-4) in their last game on Saturday. 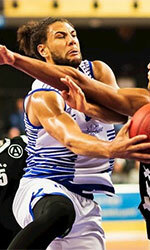 Despite his very good performance Zwolle was defeated 75-66 on the road by the one of league's weakest teams Rotterdam (#9). Kajami-Keane was the top scorer with 27 points. He also added 9 rebounds. There are only three games left until the end of the Regular Season. So now every game is very crucial. This season Kajami-Keane has very high stats. He averages: 17.8ppg, 5.7rpg, 4.1apg and 3.1spg. Kajami-Keane plays currently for the Canadian national team. #6. Power forward Andrew Nicholson (206-89, college: St.Bonaventure, currently plays in China) was the major contributor in Sturgeons' victory against the closely-ranked Jilin Tigers (24-22) 110-95 in the Chinese CBA in Wednesday night's game. He scored 30 points (!!!) and grabbed 8 rebounds in 31 minutes. Fujian Sturgeons (26-20) are placed eighth in the CBA. Nicholson has very impressive stats this year: 28.0ppg, 9.0rpg and 1.9apg in 45 games. He is a former international player as he played for the Canadian senior team two years ago. #7. 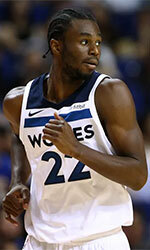 Former international guard Andrew Wiggins (203-95, college: Kansas, currently plays in NBA) was not able to help the Minnesota Timberwolves (33-40) in their last game on Tuesday. Despite Wiggins' very good performance the Minnesota Timberwolves (33-40) were defeated 117-107 in Oakland by the Golden State Warriors. He was the second best scorer with 20 points. Wiggins also added 8 rebounds and dished 6 assists. Wiggins is one of the most experienced players in a team as it's his fifth year in Timberwolves' roster. This season he has very high stats. Wiggins averages: 17.6ppg, 4.8rpg and 2.3apg. He used to play for the Canadian national team four years ago. #8. Forward Aaron Doornekamp (201-85, also represented by Interperformances, college: Carleton, currently plays in Spain) contributed to a Valencia Basket's victory against the closely-ranked Joventut (13-9) 93-80 in the Spanish Liga Endesa in Sunday night's game. Doornekamp scored 13 points. 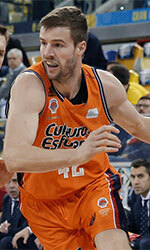 Valencia Basket (14-9) is placed fifth in the Liga Endesa. Doornekamp's overall stats this season are: 5.6ppg, 3.2rpg and 1.3apg. He used to play for the Canadian national team back in 2015. #9. Former international swingman Jamal Murray (198-97, college: Kentucky, currently plays in NBA) helped Denver Nuggets win their game against the New York Knicks (14-60) 111-93 in the NBA last Friday. Murray scored 18 points, had 5 boards, handed out 5 passes and blocked 2 shots in 33 minutes; not bad, considering it's only his third season in pro basketball. The Denver Nuggets have a solid 49-23 record this season. It was his team's sixth consecutive victory in a row. Murray has very impressive stats this year: 17.9ppg, 4.2rpg and 4.8apg in 66 games. He used to play for the Canadian national team four years ago. #10. Power forward Kelly Olynyk (213-91, college: Gonzaga, currently plays in NBA) helped Miami Heat win their game against the Oklahoma City Thunder (43-31) 116-107 in the NBA on Monday night. Olynyk scored 18 points and grabbed 9 rebounds. The Miami Heat has 36-37 record this season. Olynyk has reliable stats this year: 10.2ppg, 4.7rpg and 1.9apg. 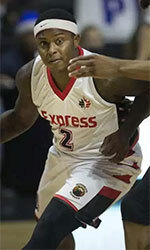 He is an international player who is currently on the senior Canadian National Team roster. #11. Former international power forward Owen Klassen (208-91, college: Acadia, currently plays in Germany) helped EnBW Ludwigsburg win their game against one of league's weakest teams Science City Jena 86-74 in the German BBL in Wednesday night's game. Klassen recorded 19 points and grabbed 8 rebounds in 25 minutes. This year Klassen's overall stats are: 9.6ppg and 6.2rpg in 21 games. He used to play for the Canadian national team two years ago. #12. International forward Thomas Scrubb (198-91, college: Carleton, currently plays in FIBA Europe Cup) helped his Italian team Openjobmetis VA win their game against the fifth-ranked Oostende 73-70 in the FIBA Europe Cup last Wednesday. Scrubb recorded 11 points, 6 rebounds and 3 assists. 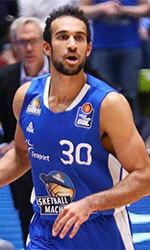 Scrubb averaged so far 11.7ppg, 4.6rpg and 1.9apg. He is also in the roster of the Canadian national team. #13. International forward Dwight Powell (211-91, college: Stanford, currently plays in NBA) was not able to secure a victory for the Dallas Mavericks (29-44) in their last game. Despite Powell's very good performance the Dallas Mavericks lost 125-129 in New Orleans to the Pelicans. He scored 16 points and grabbed 8 rebounds in 35 minutes. Powell's stats this year are: 10.1ppg, 5.0rpg and 1.4apg in 69 games. He is also Canadian national team player. #14. International forward Dyshawn Pierre (198-93, college: Dayton, currently plays in Italy) helped Banco di Srd win their game against the closely-ranked Dolomiti En. TR 88-70 in the Italian Serie A in Sunday night's game. Pierre scored 13 points, grabbed 7 rebounds and dished 3 assists. Pierre's total stats this season are: 8.2ppg, 4.0rpg and 1.3apg. He plays currently for the Canadian national team. #15. Former international point guard Shai Gilgeous-Alexander (198-98, college: Kentucky, currently plays in NBA) helped Los Angeles Clippers win their game against the Indiana Pacers 115-109 in the NBA last Tuesday. Gilgeous-Alexander scored 17 points and added 3 assists in 29 minutes. Gilgeous-Alexander averaged so far 10.4ppg, 2.7rpg, 3.2apg and 1.1spg in 74 games. He used to play for the Canadian national team three years ago. #1. Dylan Ennis (187-PG-91, agency: BeoBasket, college: Oregon, currently plays in Spain) led Andorra to a victory over the 15th-ranked Gran Canaria (8-17) 99-85 in the Spanish Liga Endesa last Sunday. He was the best player in that game. Ennis scored 23 points and added 3 passes; quite an impressive performance considering it's only his second season in pro basketball. MoraBanc Andorra (13-12) is placed ninth in the Liga Endesa. It's Ennis' first year with the team. Ennis has relatively good stats this season: 14.6ppg, 3.1rpg and 2.7apg. He has a dual citizenship: Canadian and Jamaican. #2. Dejan Kravic (211-F/C-90, college: Texas Tech, currently plays in Italy) was the major contributor in a Virtus Bologna's victory against one of league's weakest teams VL Pesaro (6-17) 78-70 in the Italian Serie A on Sunday night. Kravic scored 12 points, grabbed 5 rebounds and made 2 blocks in 24 minutes. Virtus Segafredo Bologna (12-11) is placed eighth in the Serie A. Kravic has reliable stats this year: 10.8ppg, 6.1rpg and 1.3bpg in 23 games he played so far. He is another player who holds two passports: Serbian and Canadian. #3. Brandon Clarke (203-PF-96, currently plays college basketball in the States) contributed to Gonzaga's victory against the Baylor University 83-71 in the NCAA National Tournament Round 2 on Saturday night. Clarke recorded 36 points (!!! ), 8 rebounds, 3 assists and made 5 blocks. The Gonzaga University has a very solid - conference record this season. Clarke has individually a very good year with high stats. He averages: 17.2ppg, 8.6rpg, 1.8apg, 2.9bpg and 1.2spg. Clarke is a naturalized American. #4. Brian Ofori (198-F-92, college: Regina, currently plays in Portugal) was the main contributor in Sampaense's victory against the eighth-ranked Angrabasket (9-15) crushing them 76-56 in the Portuguese Proliga (second division) in Saturday night's game. He was the top player that evening. Ofori had a double-double by scoring 25 points and getting 14 rebounds. He also added 3 assists, 3 blocks and 3 steals in 26 minutes. Sampaense Basket (13-11) is placed sixth in Group A. It was his team's first victory after five consecutive loses. There are only four games left until the end of the Second Stage. So now every game will be critical. Ofori averaged so far 11.9ppg, 8.0rpg, 2.1apg, 2.1bpg and 1.1spg in seven games. #5. 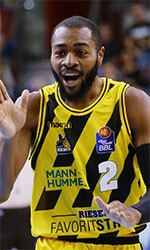 Kassius Robertson (191-G-94, college: Missouri, currently plays in Germany) could not help BBC Bayreuth (12-12) in their last game on Wednesday. Despite his good performance BBC Bayreuth was defeated 76-72 on the road by the lower-ranked Deutsche Bank Skyliners (#13). Robertson recorded 11 points. Robertson averaged so far 12.8ppg, 2.2rpg and 2.9apg. #6. Luguentz Dort (193-G-99, currently studies in the States) contributed to an Arizona St.'s victory against the St. John's University 74-65 in the NCAA National Tournament Round 1 on Wednesday night. He scored 21 points and grabbed 4 rebounds in 34 minutes. Dort has very impressive stats this year: 16.1ppg, 4.3rpg, 2.3apg and 1.5spg in 34 games. #7. Jermaine Haley (201-G-97, is currently at the American university) contributed to W.Virginia's victory against the Grand Canyon State University 77-63 in the NCAA National Tournament Round 1 last Wednesday. He scored 24 points and grabbed 4 rebounds in 33 minutes. This year Haley's total stats are: 7.1ppg, 4.1rpg and 2.4apg in 36 games. #8. Mfiondu Kabengele (208-F-97, currently plays college basketball in the States) contributed to an Florida St.'s surprising victory against the Murray State University crushing them 90-62 in the NCAA National Tournament Round 2 on Saturday night. He recorded 22 points, 7 rebounds and 3 blocks. Kabengele averaged so far 13.4ppg, 5.9rpg and 1.5bpg. #9. Obi Okolie (196-G, currently plays college basketball in the States) contributed to Brown's victory against the University of Alabama at Birmingham 83-78 in the NCAA National Tournament Round 1 on Wednesday night. He scored 26 points (!!!) in 37 minutes. Okolie averaged so far 12.3ppg, 4.1rpg and 2.0apg in 32 games. #10. Emmanuel Jones (183-PG, college: Lakeland, currently plays in Taiwan) was not able to help Yulon Luxgen in their game against Fubon Braves in the Taiwanese SBL. Despite his very good performance on Saturday night He recorded a double-double by scoring 27 points and getting 12 rebounds. This season Jones has very high stats. He averages: 19.0ppg, 8.3rpg and 1.3spg.